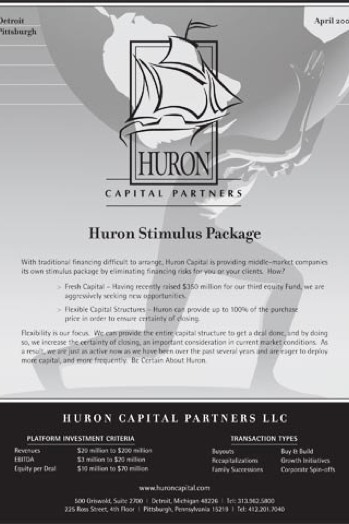 Huron Capital Partners LLC is a Midwest based equity investment firm focused on investing in growing, established and profitable companies. They specialize in partnering with management teams to facilitate corporate spin-offs, family succession transactions, recapitalizations, buy-and-build strategies and management buyouts. As part of their efforts to help stimulate the business economy in their investment field, a series of ads were created to announce their own “Stimulus Package”.